The Dean Court Community Centre Association is formally off the ground and running, after local residents unanimously voted to adopt the Constitution and elect local residents to serve on a Management Team and body of Trustees, Sunday afternoon at St Andrews Hall. The next steps involve securing a lease from the District Council, applying for grants to be able to get on with the necessary renovations, and finalising a business plan. Want to help? Please get in touch to volunteer your expertise, gladly welcomed. 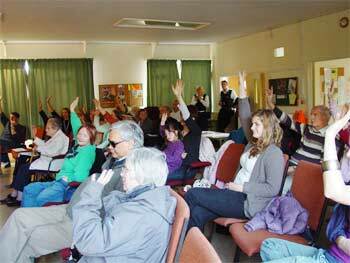 ← Dean Court Community Centre Needs YOU!